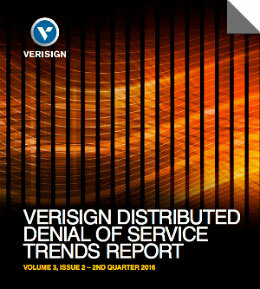 Verisign DDoS Trends Report – Volume 3, Issue 2, 2nd Quarter 2016 (Click to Download)Verisign today released its Q2 2016 DDoS Trends Report providing a unique view into online distributed denial of service (DDoS) attack trends from mitigations enacted on behalf of customers of Verisign DDoS Protection Services, and research conducted by Verisign iDefense Security Intelligence Services. Every industry is at risk as DDoS attacks continue to increase in frequency, consistency and complexity. Comparing year-over-year attack activity, Verisign mitigated 75 percent more attacks in Q2 2016 than in Q2 2015. The largest attack mitigated by Verisign in Q2 2016 peaked at 250+ Gbps before settling in at 200+ Gbps for almost two hours. Verisign also observed a growing trend of low-volume application layer, or Layer 7, attacks that probe for vulnerabilities in application code and exploit HTTP/S field headers within request packets to disable applications. These attacks were frequently coupled with high-volume UDP flood attacks to distract the victim from the Layer 7 attack component, often requiring multiple and advanced filtering techniques. — Average peak attack size observed by Verisign continues to be high at 17.37 Gbps, a 214 percent increase year over year. — IT Services/Cloud/SaaS, representing 45 percent of mitigation activity in Q2 2016, remains the most frequently targeted industry for the seventh consecutive quarter, closely followed by the Financial industry, representing 23 percent of all mitigations. — User Datagram Protocol (UDP) flood attacks continue to dominate, accounting for approximately 56 percent of attacks in Q2 2016. — Sixty-four percent of the DDoS attacks mitigated by Verisign in Q2 2016 employed more than one attack type. Finally, Verisign's recent trends show an increase in application layer attacks, which are some of the most difficult attacks to mitigate because they mimic normal user behavior and are harder to identify. Read the report to learn more about Layer 7 attacks and what organizations can do to protect their online properties and networks. For more DDoS trends in Q2 2016, download the full report, and be sure to check back in a few months when we release our Q3 2016 DDoS Trends Report.